Enjoy game drives in Amboseli, Serengeti & Ngorongoro National Parks on this 12 day Africa tour as well as nature walks & cultural dance performances. Welcome to Kenya, and to the bustling city of Nairobi. On arrival, you will be met and transferred to your hotel for a welcome briefing from your Tour Director. Drive south to Amboseli National Park and check into your lodge spectacularly located in the foothills of Mount Kilimanjaro, Africa’s highest mountain. Morning and evening game drives in this remarkable reserve known as a photographer’s paradise with the most popular displays of wildlife including lion, elephant, leopard, cheetah and buffalo. You’re Invited: Visit a traditional Maasai village and be welcomed by the village chief to experience a culture famous for its close relationship with wildlife and the earth. Travel to Tanzania today via the Namanga border and arrive in Arusha for lunch. Arusha is located at the base of Mt Meru. Ngorongoro conservation area is often referred to as Africa’s Eden. 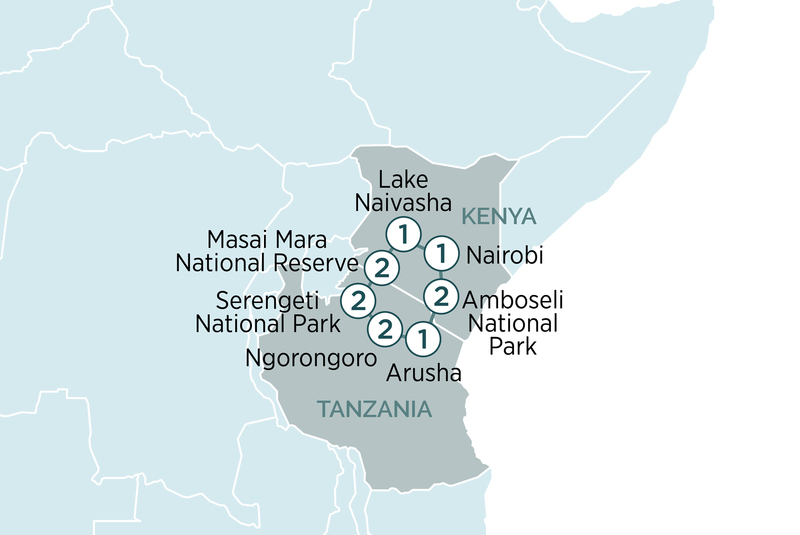 It is home to the vast Ngorongoro crater. Witness a spectacular sunrise over the crater, then we visit Olduvai Gorge. Later, enter Serengeti National Park with its vast central plains. Enjoy morning and afternoon game drives in search of Africa’s 'Big Five' animals. After breakfast, board your included scenic flight over the Serengeti and the Mara. Masai Mara National Reserve covers some 1500 square kilometres adjoining the Serengeti National Park across the border. During the months of July to October, millions of wildebeest, impala and zebra cross the border into the Masai Mara in search of water, in what is known as the Great Migration. Enjoy morning and evening extended game drives through the Masai Mara which is situated in the Great Rift Valley in primarily open grasslands, home to large herds of zebra, impala, antelope and gazelle. The lodge hosts an outdoor ‘boma’ dinner where you can taste African specialties and experience the night sounds of the wild. Discover More: Hot air balloon flight over the Masai Mara (additional cost, must be booked on tour). Heading along Kenya’s great escarpment to Lake Naivasha and the Great Rift Valley. Your lodge tonight is set in one hundred and fifty acres of grassland with resident giraffe, hippo, waterbuck. After breakfast, board your boat for a cruise to visit Crescent Island and enjoy a walk in a tranquil environment. Afterwards, head back to Nairobi where you begin the journey home (book flight after 6pm).